The Symposium Planning Committee provides support, advice, and oversight to designated symposia organizing groups throughout their symposium planning process. The Committee also helps to recruit and develop future symposia sites. The Co-chairs of the Symposium Planning Committee are Dana Grossman Leeman and Christine Wilkins. Committee members include: Diane Mirabito, Jahmani Hylton, Alexis Howard, Sari Skolnik, John Genke, and Reineth Prinsloo. 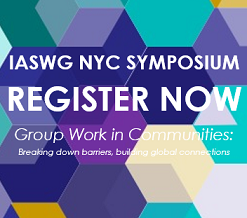 If you are interested in learning how to host an upcoming IASWG symposium, visit our “deconstructed” Guidebook to learn about the major components of producing an IASWG Symposium. Included here is information about our current, upcoming, and previous symposia. Following each symposium, proceedings are produced that reflect the kinds of ideas and issues current in the field at that time. Past proceedings can be found in the Resources section of this website, or check out our proceedings publisher.